Not many smartphones get everything right. The Samsung Galaxy 5 is definitely the exception to the rule because every component on this phone seems to have been tweaked to enhance the user experience. The TouchWiz interface on top of the KitKat operating system from Android has been streamlined, the chipset gives the phone some blistering speeds, and it has been equipped with a camera that mobile photographers are going to love. Although this is a premium smartphone that comes with a premium price, those who use the Samsung Galaxy 5 will find that there is a lot of value in the price being paid. At first glance, the average user isn’t going to be able to distinguish between the Galaxy 4 and the Galaxy 5. Both have similar shapes, similar performance stats, and even the same molding. The only main difference when looking at the design of the screen is that the home button is a little different with the Galaxy 5. Flip the phone over and you’ll get a different story. The back of the Galaxy 5 has a wonderful matte finished that is very resistant to fingerprints. The back panel is also dimpled to further mask the fingerprints that inevitably accumulate on a phone. It feels like every Galaxy phone, like a bit of plastic, but overall the quality of the phone is without question. The Samsung Galaxy 5 does fit nicely in the hand. At 5.59 inches in height and 2.8 inches in width, the phone is just 8.1 mm thick. Weighing in at 145g, users aren’t going to get tired by carrying this phone. It might be a little taller and heavier than other phones, but the end result is that it makes users feel like they’re using a premium product. The AMOLED HD display is 5.1 inches in size and offers images that are beautiful and precise. Video streaming and photographs look sharp and clear through the display. It’s powered by a 2.5 GHz quad core processor from Krait and the Adreno 330 GPU does its job rather effectively. 2 GB of RAM comes standard and microSD storage can reach a peak of 128 GB. Internal storage is either 16 GB or 32 GB, depending on the model that is being selected. You’ll find the standard mUSB port on the Samsung Galaxy 5, so if you’ve got a bunch of old chargers floating around, you’ll still be able to use them. The advantage is that Samsung has also equipped the Galaxy 5 with a USB 3.0 connection so that charging the phone up can be done ridiculously fast. When connected to a computer, file transfers are equally fast. An added advantage is that Samsung has equipped the Galaxy 5 with some water resistant features that other phones just don’t have. There’s a rubberized gasket situated behind the back cover and a clip covers the USB ports effectively. The Samsung Galaxy 5 is rated high enough that it can be submerged in up to 3 feet of water for up to 30 minutes, although testing that capability might not be the best of ideas. As for the TouchWiz design, the update to it makes navigating through menus or accessing the quick settings a pretty simple process. Truth be told, it feels a lot like the old Windows platform navigation options that were on some of the older operating systems, like Windows 95. Most screens have a menu button and the settings can be seen in several different layouts, so everything comes together nicely and users can always access the Google Search box to find something. Rounding out the Samsung Galaxy 5 experience is a full suite of expected features. Set up instant messaging, take advantage of the digital compass and barometer, and browse the internet using the HTML5 browser. Wi-Fi is enabled on this phone, including tethering, and it will play virtually all multimedia files, either directly downloaded or streamed online. What’s the Verdict on the Samsung Galaxy 5? With dual video call capabilities, Bluetooth, GPS, and infrared port, and all of the modern features one would expect with a new smartphone, the Samsung Galaxy 5 is easily one of the best phones on the market. The S Voice features are much improved on this model of the Galaxy and users may be eligible for up to 50 GB of cloud storage space as well. This smartphone also recognizes air gestures and features smart scrolling, pausing, and staying. The battery on the Samsung Galaxy 5 is a lithium-ion 2800 mAh battery that offers up to 21 hours of talk time. Data usage will drain the battery a little above this amount, but GPS use will kill the battery quickly if it used extensively. If used for music playback exclusively, however, the battery life is rated to last above 65 hours. There are some niche components that some users may find a bit questionable. At the top of the list is the heart rate monitor. For it to be used effectively, you would need to hold the phone in your hand during the entire workout. When your hands get a bit slippery, there’s a good chance for the phone to drop and at this price point, that’s not something that you want to have happen. What’s the final verdict? The Samsung Galaxy 5 offers users a number of key features that they are going to love. Although the step-up from the Galaxy 4 is rather minimal, the improved processing speeds and slightly larger touchscreen do offer some advantages. 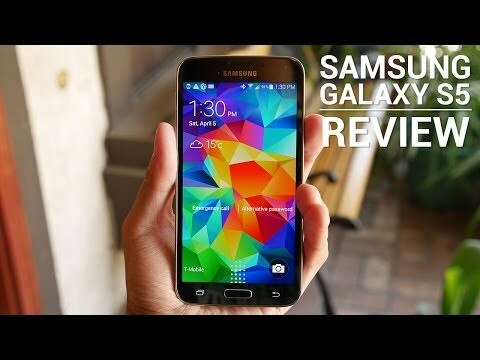 For those who are more on a budget, the Galaxy 3 or Galaxy 4 will still provide an amazing smartphone experience for a lesser cost. For those who want a premium smartphone that can do virtually anything, however, the top choice on the market today is easily the Samsung Galaxy 5.